Who Among us has Prunaphobia? Many people fear pruning, simply because they don’t understand the concept of cutting something back to help it grow more! It’s counterintuitive, and it was that way for me, too. Why would you cut something back that looks perfectly healthy? The concept is a funny one, and consequently, I have several friends I call “prunaphobic.” A basic understanding of the following principles will equip you to prune with confidence. Pruning is done for several reasons: to control size or shape, to remove dead or diseased branches or limbs, to improve structure or to stimulate new growth or flowering. Pruning also can improve the health and look of a plant by allowing more light and air into the center. So contrary to what many think, cutting or pruning a tree, shrub or plant can be good for it by stimulating new growth. When a terminal bud or growing tip is removed from the parent plant, a growth suppression hormone called auxin is removed as well. Auxin, which is located in the terminal buds, suppresses the growth of other buds, signaling them to remain dormant. By removing the tip, nearby buds are no longer suppressed and may grow rapidly in response. This lack of auxin allows new buds or branches to begin to grow, quickly replacing the one removed. If leaf buds are present on both sides of the branch, you will likely get two or more new branches for each one that is cut. As you consider whether to prune a particular plant, you should know that there are better times of the year to prune. Early spring is generally the best time to prune, just prior to new growth starting to develop. Most plants and trees utilize stored energy from fall and winter and will produce new growth just below the pruning cut. 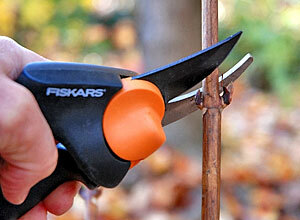 Late winter is the next best time to prune, before new growth occurs. Although pruning does stimulate new growth, in winter plants will typically not break dormancy until temperatures signal the appropriate time, even if pruning has recently taken place. Early to mid-summer, after full leaf expansion is an acceptable time. However, much of a plant’s stored energy has gone into producing the new growth of spring. If you cut this new growth off, you’ve wasted the plant’s energy. It will then be stimulated to put on new growth, yet the normal reserves for this process may have become depleted. This extra demand can be stressful to the plant in summer when conditions are likely to be dry and hot. The least favorable time to prune is in early- to mid-fall. Pruning at this time can signal the plant to produce new growth, just as it is sending nutrients and energy into reserves for the cold months ahead. Not only can valuable reserves be diverted back into new growth, new growth can be damaged or killed by colder temperatures. This is especially true for evergreens. Any damage at this point could also create access points for over-wintering pests and diseases. I’m often asked why someone’s flowering shrubs aren’t blooming. In most cases it comes down to only one of two reasons. Either the plant isn’t getting enough sunlight, or it’s been pruned at the improper time. Proper timing of pruning needs to be considered for flowering shrubs. Certain shrubs bloom on new wood. These shrubs produce flowers on the current season’s growth. They can be pruned in late winter and still produce flowers the same year. Examples include butterflybush, abelia and clethera. Other shrubs produce flowers on old growth or wood produced from the previous year. Pruning these shrubs in late winter would remove all the flower buds already formed. They were set in the previous year. Shrubs blooming on old wood are best pruned immediately after flowering. Azalea and rhododendrons, hollies and forsythia are among this group. There’s no need to fear pruning. Once you can convince yourself that in most cases, pruning is advantageous, then it’s just a matter of getting started. The more you do it, the more confidence you’ll have. How hard of a pruning can burning bush take? Mine are about 7’×8′. I need to get them back down to a reasonable size. They didn’t have the dwarf size back then.